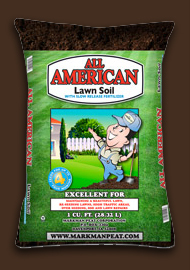 All American Lawn Soil with slow release fertilizer is a superior blend of composted materials, sphagnum peat moss that is ideal for grass seed germination that will produce a lush thick lawn. Derived From: Polymer-coated Urea, Polymer-coated Ammonium Phosphate, Polymer-coated Ammonium Nitrate, Polymer-coated Potassium Sulfate, Polymer-coated Calcium Phosphate, Ammonium Phosphate, Ammonium Nitrate, Potassium Sulfate and Magnesium Ammonium Phosphate. * A portion of the Nitrogen, Phosphate, and Potash have been coated to provide the following slowly available nutrients: 8.8% Nitrogen (N), 3.6% Available Phospate (P2O5) and 4.0% Soluble Potash (K2O).